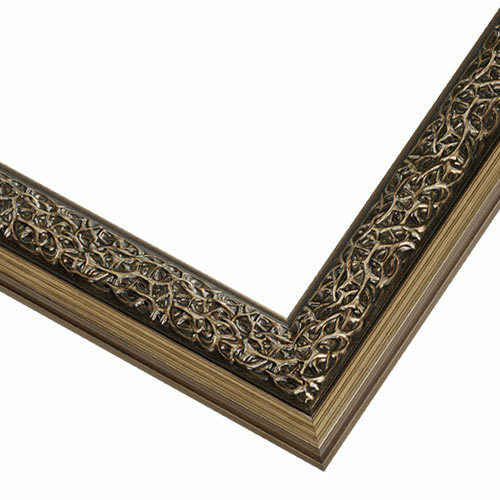 Take a walk on the wild side with this edgy earthen gold picture frame with a tangled vine motif and charcoal antiquing. It’s a unique photo frame, wedding portrait frame or document frame. Handcrafted by our Artisans from natural wood grown in sustainably managed forests. Customize your size to 1/8th of an inch! Your art, your way with pictureframes.com. Lightning fast shipping. I had a busy piece of artwork, and I didn't want to just put a black frame around it, and this frame worked so much better than I expected. The gold is muted enough that it's not garish, and with enough mat space between the artwork and the frame, it enhances the whole piece delightfully. It works with the painting I want framed. I choose this because I thought it would compliment a portrait I painted of a native american man. Native Americans are very into things involving nature.